... 1807, Harriet Taylor Mill (left) was born in London, England. 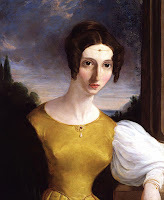 (image credit) Married at 18, the woman then known as Harriet Taylor gave birth to 3 children, "became active in the Unitarian Church and developed radical views on politics," including support for women's rights. She met philosopher John Stuart Mill, "the first man she had met who treated her as an intellectual equal." They exchanged comments on each other's essays over the years, to a degree that some consider her not only an author of her own philosophical works, but also a significant contributor to some writings of his. By 1833 she was living separately from her husband, rearing their daughter while he cared for their sons. In 1851, 2 decades after they'd met and 2 years after her 1st husband died, Taylor and Mill married. She published Enfranchisement of Women the same year. A victim of tuberculosis, Harriet Taylor Mill died from respiratory failure in 1858; thereafter, her daughter Helen and husband John worked together to finish his The Subjection of Women (1869).